On the day Rabbit appears, there is a slight wind. Stag takes him in his arms and watches over him. As Rabbit grows, Stag knows he will one day leave. And that's okay. So long as he doesn't go too fast. Of course, Rabbit does go too fast and falls into some trouble. The Soldier, who is never at peace, extends his sword and helps Rabbit. Then they meet Cat. And a companionship is formed. Meanwhile, Stag, who has been alone for some time now, meets Book. And this is when the connections between the book's characters begin to align. 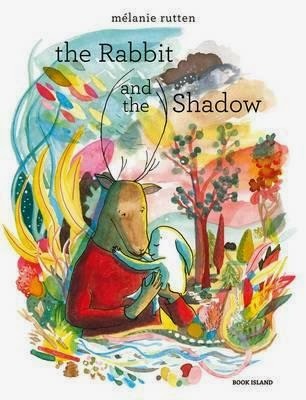 This is a beautifully-penned, high text picture book with vibrant illustrations and whimsical undertones. It's a book about growing up, leaving loved ones behind and facing the challenges of the world. It's also about facing fear and believing in a higher, greater power--in this instance, the power of love. The text is quite abstract in parts, but this would only deter adults thinking kids wouldn't 'get it' rather than the kids themselves. Rich with meaning and delicate, emotional concepts, this is a beautifully-produced book that will leave you thinking.